The PDCA (Plan-Do-Check-Act), also known as the Deming cycle, is an essential technique for process improvement. It’s a framework that helps you change and improve your processes. PDCA is a methodology for achieving continuous process improvement. It’s essentially a feedback loop of improvement – you establish how the process operates as-is, figure out how to improve it, and finally, implement the changes. The concept was first developed by Dr. Williams Edwards Deming, a management consultant, in the 1950s. Plan – Identify what the problem is and analyze it. Find process inefficiencies. Develop potential solutions. Do – Implement the solution on a small scale (for minimized risk). Check – Benchmark your new process to the old. Is it more efficient? Were you right about the problem / solution? If the solution is less than satisfactory, go back to the “plan” phase and come up with better options. Act – If the solution was helpful, implement it company-wide. PDCA, as a framework, can be extremely helpful if combined with just about any process improvement methodology. Problem-Solving – Whenever something breaks down or isn’t functioning as it should be. PDCA can be used as an analysis tool for uncovering the issue and coming up with a solution. Process Improvement – The fact that something is “working” doesn’t mean it’s functioning the best it could be. You can use PDCA as a means of finding potential improvements to existing processes. To help you use PDCA for your organization, we’ll dive deeper into each of the steps and explain the exact steps you’ll need to take. Before you can make any change to the process, you need to pinpoint the exact issues you’ll be addressing. 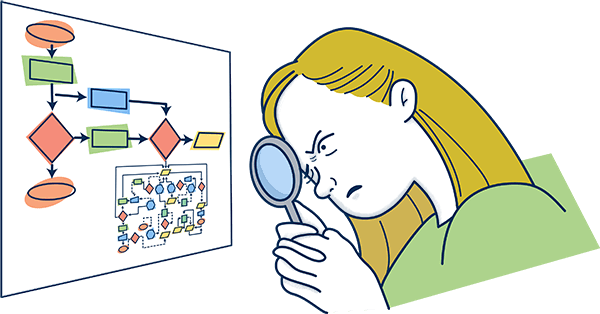 If there’s an explicit problem you’re trying to solve, you could use something like the 5 Whys analysis to find it. The gist of the methodology is, you keep asking “why” until you uncover the root cause of any problem. Once you know what the root cause of the problem is, you can start coming up with solutions. In this case, if the company revenue is taking a significant hit, it might be a good idea to switch back to the old partner (despite the rates). Or, the company could always look for new potential partners. You can use the diagram to pinpoint inefficiencies within the process and come up with improvement ideas. Not sure how, exactly, you could improve the business process? The diagrams not helping too much? These 4+ methods might help. Once you’ve found the right solution to a problem or a new way to optimize a process, you can start the implementation. This should, however, be on a small-scale. You can’t know for sure whether your fix is going to be successful, and running it company-wide can be extremely risky. The “small-scale” depends on what the process is. More often than not, though, this means a single team, department, or a manufacturing site (as opposed to the whole plant). Now that you have empirical data on how well your new process works, you can benchmark it to the old. It’s crucial to be very critical of this part, though. At a glance, your solution might be working as planned. Later, however, you might discover that it only works in the short-term. For example, with your new process, you might be able to increase product output. While this sounds amazing at first, you might later realize that the new process also has a significantly higher defect rate, bringing you all the way back to square one. So, unless you’re 100% certain that the solution you’re using is the best option, you might want to consider other possibilities. If you’re not, you can always start all over from the “Plan” phase. Once you’ve found the best potential solution, you can move on to the final phase. You can finally start applying the solution company-wide. You should consider, though, that PDCA is a loop, not a one-time initiative. While your process is functioning better now, you can’t really know if that’s the best it can be. Maybe you’ll discover a better way of carrying out a certain process step? Or, some new software could help automate the process? Your new process has now become the baseline, which you should always try to improve. You can repeat the PDCA process as many times as needed until you’re certain that the process is as efficient as it can be. Definition – What is a Sales Cycle?